The child grows up with his father, practicing karate. At age 18, he sees other young adults his age running around the House freely. How did they escape the mirror? If such a thing were possible, why wouldn’t his father teach him how? After his father leaves that day, he tries to push through the mirror. He shoves his back into it with all his might, but he remains a mere reflection. Disappointed, he lays down for the night. One day during training, an idea hits him. What if… what if he tries NOT to mimic his father? Would he cease to be a reflection? He gives it a try, but cannot. He tries again. And again. Finally… his hand slants too far left. He did it! In that instant, light explodes from him, rippling the air and enveloping the mirror. The light fades just before his father turns around to face him. His father hadn’t seen any of it. That night, the young man tries to escape again. The mirror still wouldn’t let him through! The next day, the young man mimics as usual. But something is different. He isn’t a precise reflection. His moves are sluggish and lack passion, unlike his father’s. How can this be? He tries to do everything perfectly… but finds he cannot. The anger in his father’s gaze tears a hole in the young man’s heart, despising his hopes as a child’s fantasy. He opens his mouth to protest, but no words come out. He can’t speak. He is just a reflection after all. All resumes the same as it had been before. He copies his father’s every move. Many stop to watch the two, awing at the father/son duo. If one would stare at them long enough, they would soon notice the emptiness in the young man’s eyes. running away from her parents? How did she escape? Suddenly, a huge thug appears from around a corner and grabs her. Her screams tear at the young man’s heart, but he can only watch as she is dragged off and then tossed into the man’s mirror. Heartbroken, the young man slams himself against the mirror. But in vain. He has to do something! He decides to try to go out of sync with his father, one last time. It was his only hope. That day, sweat covers his brow as he tries to break from his father’s movements. He had done it in mere minutes the first time. Now, it has been an hour! He keeps trying. Finally, he breaks free and nearly trips. His father’s stunned expression slowly darkens to a deep scowl. The young man pushes against the mirror. Surely, if he escapes now, his father would understand. This was his chance to prove that he could be more than a reflection! Nothing happens, to the young man’s horror. Alone, the young man fights back tears as he paces in the mirror. Why can’t he escape? Most other reflections had left long ago. What is wrong with him? Did they know something he didn’t? A passing group of people stop their merriment to look at him. When they notice that his parent is absent, their curiosity quickly turns into deep pity. They point and whisper among themselves before shrugging and moving on. A man in his thirties walks up to him then holds out his hand. “Take it.” He says. “I can’t!” the young man cries. The words strike the young man’s heart like a hammer. 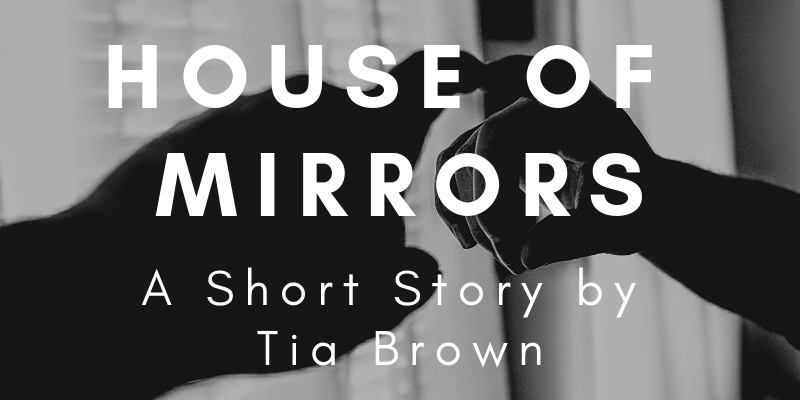 You can find more by Tia Brown on Patreon.